1.) Turn off the irrigation system! The ground is saturated and now needs to dry out and this is the perfect time to save you some money! Take advantage of the tropical moisture we are receiving, we are under the influence of El Nino again. 2.) Mow your grass two times a week as the grass is responding with rapid vegetative growth produced by the rain. (Mowing is also a great physical workout!) Reducing the height of the grass allows the sun to dry out the soil to prevent root rot of grass and plants. 3.) Tree and shrub pruning becomes obvious during rains, you need to remove branches that are weighted down and dragging the ground or overhanging the walks and driveway. If you have a shady area, now is a good time to remove the lower branches on the trees and prune down tall shrubs to allow sunlight and air circulation in shady areas. Shade is where mosquitos love to live, so we need to make the area undesirable for them by bringing in air circulation, wind and sunlight. Now we have implemented treatments to reduce mosquito population in the yard, what can we do for our self to enjoy the outdoors again, searching for a natural insect repellent? I first learned about American Beautyberry, Callicarpa americana, as a mosquito repellent during my visit to Brookhaven, Mississippi. We were walking through the woods and I started to feel the bite of mosquitos and commented, “I should have sprayed with Deet before walking through the woods.” Jim Bonner, owner of Bamboo Plantation, grabbed a branch of Beautyberry, and stripped the leaves off and handed them to me and said, “Crush and rub these leaves on you”, they act as a mosquito repellant. I did and it worked! Talking with another friend who worked for a nursery in the National Forest, commented, “We never had mosquitos at the nursery,” because the Beautyberry was growing wild in the pine forest next door. So I think it is definitely worth the effort to strategically plant Beautyberry around dog kennels, livestock areas, and outdoor sitting areas, it can repel mosquitos just growing and also be close enough to grab a handful to crush and rub on the body. This traditional folk remedy has been used by people in the Mississippi Hill Country for over a century. They cut branches, with the leaves still on them, crush the leaves and stick the branches between the harness and the horse to repel mosquitos, horseflies, and deerflies. This folk remedy did not go unnoticed by the University of Mississippi. Callicarpa americana, known as American beautyberry or French Mulberry, is a native, deciduous shrub that grows 4-6’ tall and as wide, has large leaves and produces flowers followed by clusters of purple berries in late summer or fall in the south. It is found growing naturally in sunny areas of woodland forests and the purple fruit is eaten by armadillos, raccoons and possums. Growing in a variety of soils, this drought tolerant “beauty” is a must for every garden. 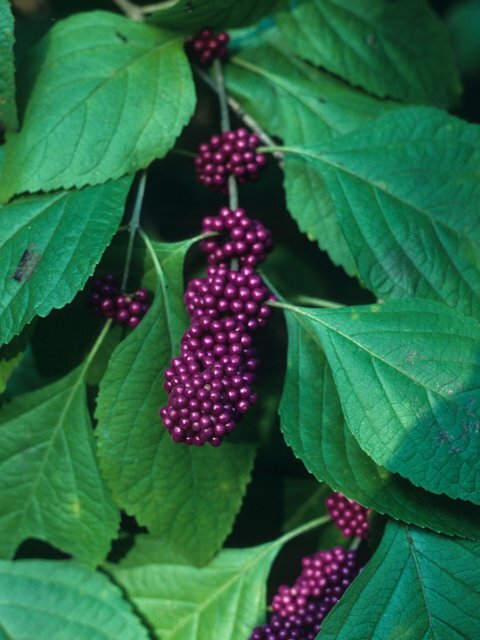 Originally planted for its’ ornamental value and toughness, the Beautyberry moves up to the top of our list as the Beauty that stopped the Beast!